Christian Feminism Today (formerly known as the Evangelical and Ecumenical Women’s Caucus) is pleased to offer a $1,000 scholarship to a college senior or graduate student who is pursuing studies in religion or theology. The scholarship is awarded to a student who aspires to exemplify the values and achievements of Nancy A. Hardesty, a founding member of the Christian Feminism Today organization. The 2018 application window will open in February of 2018. Hardesty spent much of her career in higher education. From 1988 to her death in 2011, Hardesty taught in the Department of Religion and Philosophy at Clemson University in South Carolina. Before arriving at Clemson, Hardesty also taught at Emory University’s Candler School of Theology. Hardesty’s first book, co-authored with Letha Dawson Scanzoni, was All We’re Meant to Be: Biblical Feminism for Today published in 1974. The ground-breaking book has gone through several editions, and was noted by Christianity Today, in its 50th anniversary issue, as one of the top fifty books influencing the evangelical movement. 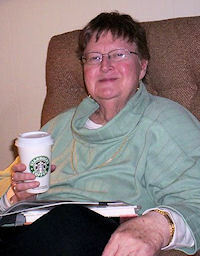 Hardesty subsequently wrote other books on topics ranging from women in the Bible to inclusive language in the church. The 2018 scholarship recipient is Elyssa Salinas-Lazarski, a doctoral student at Garrett-Evangelical Theological Seminary. The 2017 scholarship recipient is Erica Saunders, who is working on her M.Div. at Wake Forest University. The 2016 scholarship recipient is Rev. Darcy Metcalfe, who is beginning her doctoral studies at the University of Iowa. The 2015 scholarship recipient was Katie Deaver of the Lutheran School of Theology at Chicago. The 2014 scholarship recipient was Jennifer Newman, a student at George Fox University. The 2019 application window will open on February 1, 2019. The application is available now, here. Click here for the 2018 award press release. Click here for the 2017 award press release. Click here for the 2016 award press release. Click here for the 2015 award press release. Click here for the 2014 award press release. 1. Applicant must be a senior in college, a graduate student studying religion or theology, or must be attending seminary/divinity school. 2. Applicant must be planning to attend a university or seminary in the US or Canada during the fall 2019 semester. a. Three letters of reference, with at least one letter from a professor. Make sure accurate contact information is included! c. The completed application form. ● The influence Christian feminism has had on their personal and professional pursuits. ● The impact they hope to have on the field of Christian feminism. ● Current social justice issues with which Christian feminism should be concerned. The deadline for submitting the 2019 application is April 30, 2019. Recipient will be notified by June 1, 2019. Check will be sent to the school in August. Click here for the 2019 NAHMS application. The more controversial issue is language about God – the capital “He.” Some people seem to be convinced that God really is male. Many of these are the same people who answer, “God made man is His image” and assume that is, in some way, a literal statement.